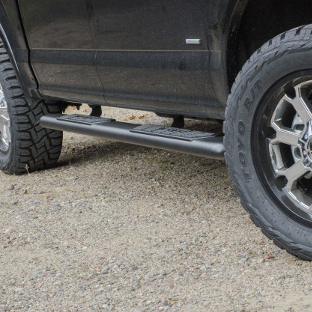 AscentStep™ running boards by ARIES are designed to give modern pickup trucks and SUVs the accent they deserve. 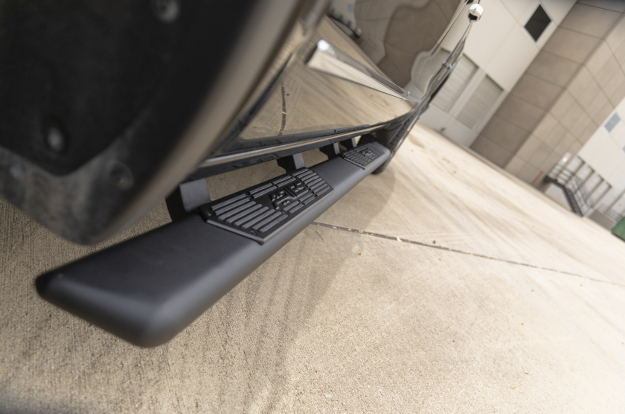 These uncommonly stylish side steps have a sleek teardrop profile, fully blended ends and highly unique, dual-construction step pads. ARIES AscentSteps™ are constructed from high-strength steel and come with a combination finish for superior elemental resilience. They install with no drilling and no fuss, utilizing our innovative VersaTrac® system. 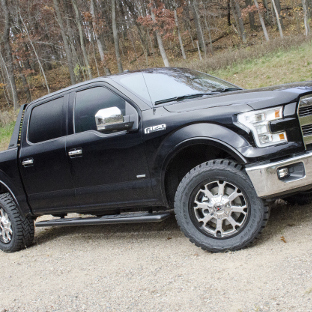 You don't buy a shiny new truck only to slap cheap running boards on it. 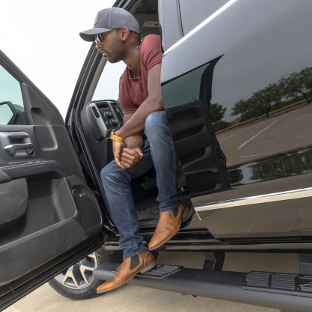 ARIES AscentSteps™ are a high-end running board option, engineered with sleek, subtle style to give that truck the accent it deserves. 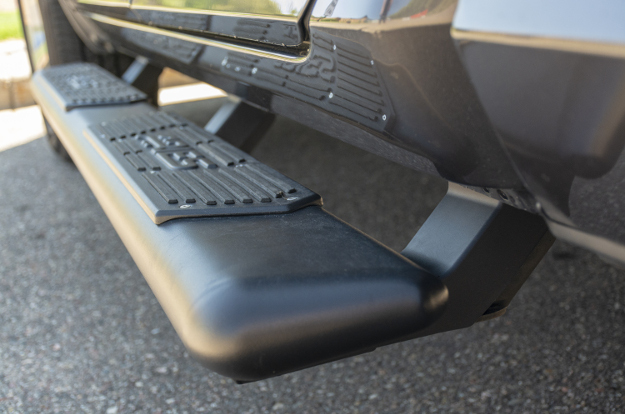 AscentStep™ running boards install with original-equipment-like integration, using our VersaTrac® mounting system. They require no drilling, no difficult vehicle modifications and no hassle. 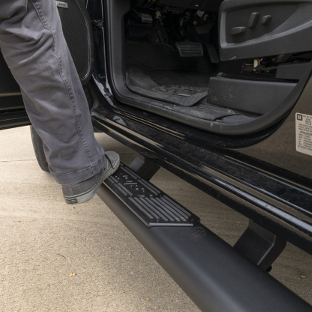 Experience running boards for the modern age with ARIES AscentSteps™. 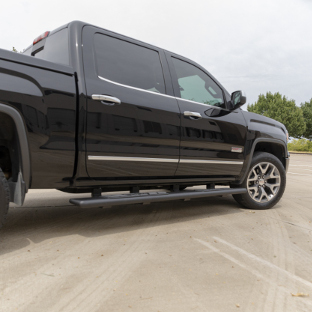 Their unmistakable teardrop design sets the tone for something truly brilliant, rising above the common look of other tubular running boards. 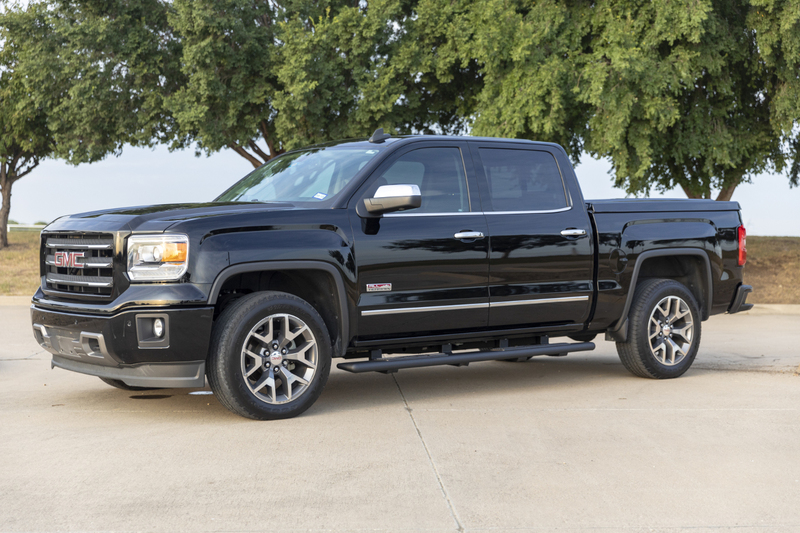 The subtle curves and taper of the boards commands attention without the obnoxious attitude of gaudy, outdated truck accessories. 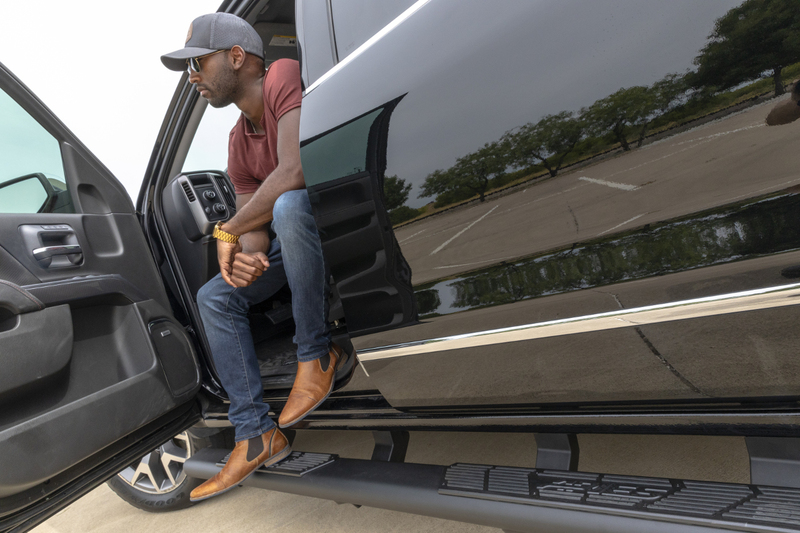 For a final touch of finesse, AscentStep™ running boards have welded end caps that are blended into the boards for a seamlessly contoured look. Modern style demands modern functionality. 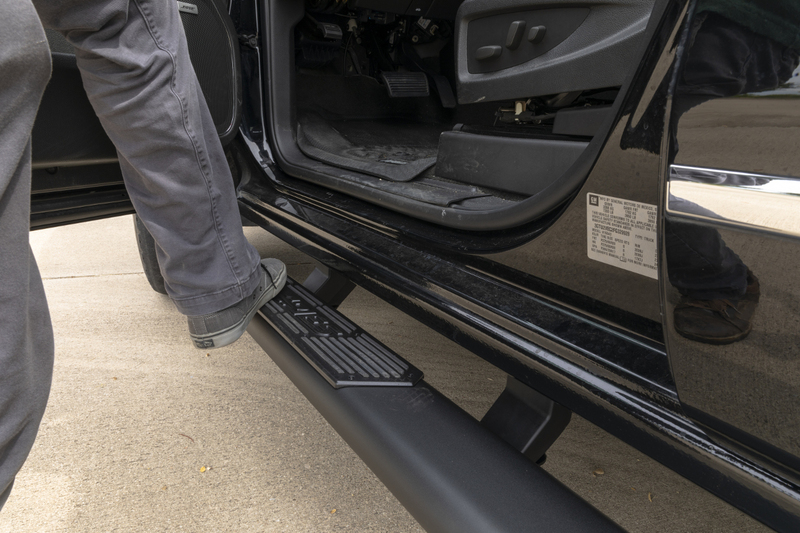 AscentStep™ running boards offer a sophisticated alternative, featuring a highly unique polyethylene tread with a stainless steel overlay. 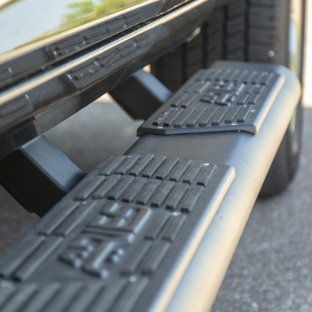 The poly provides dependable, non-skid traction when stepping into your truck, and it protrudes through the metal overlay to further complement the board's blended finish. The stainless steel plate overlays also absorb any scratches, scuffs or other damage from regular foot traffic. The plates easily resist rust, while the steel boards underneath remain well-protected. 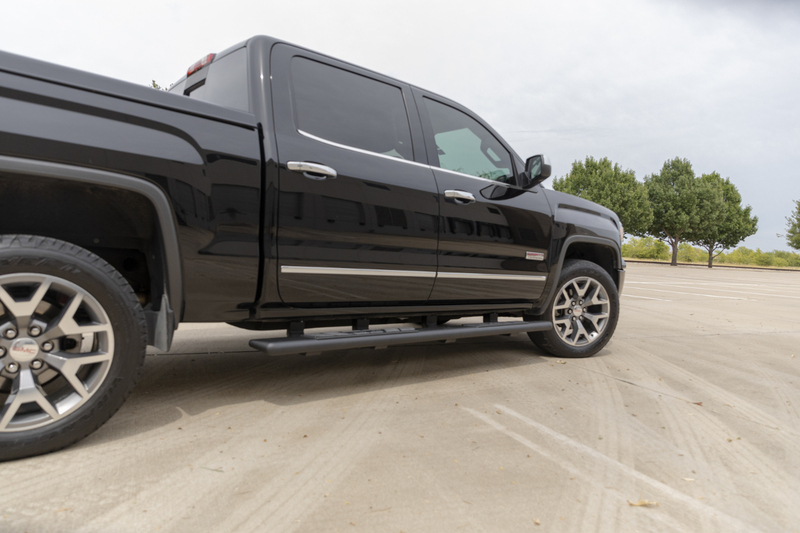 Combining the intuition of American engineering with the very best in truck side step technology, AscentSteps™ by ARIES are designed for excellence. 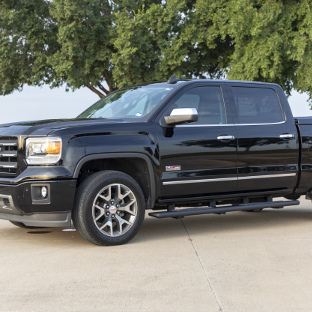 We construct them using high-strength steel to ensure the utmost rigidity and comfort every time you step up into your truck. 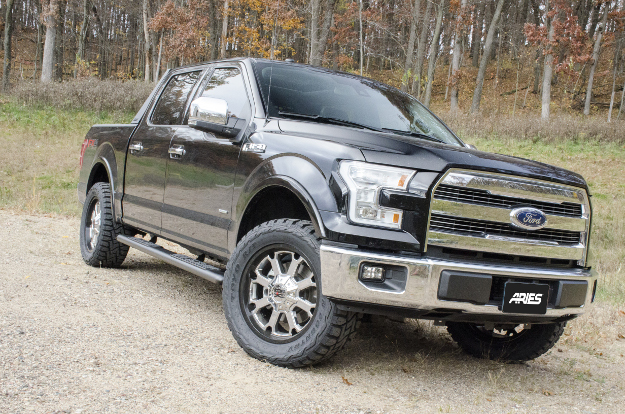 Additionally, the brackets used to mount ARIES AscentStep™ running boards are made from strong carbon steel, making these side steps a worthy extension of your vehicle. 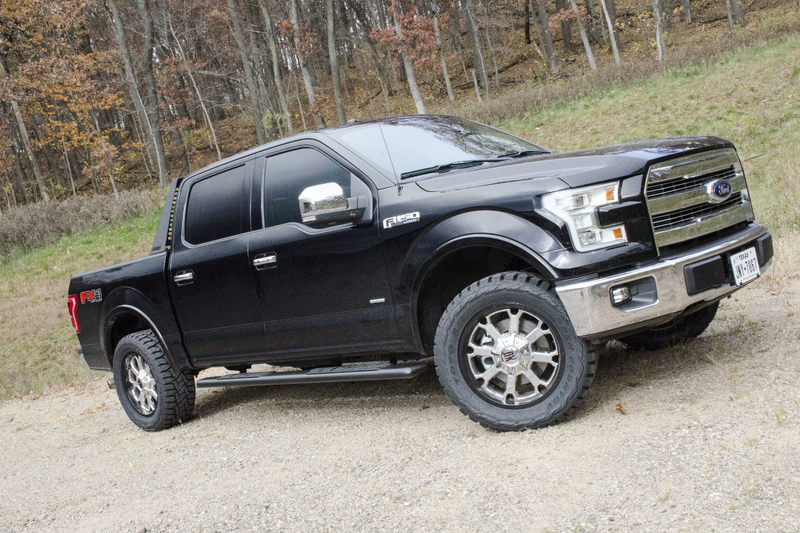 AscentStep™ running boards put rust in its place with their exceptional, dual-layer finish. First, the boards are treated with an E-coat formula, shielding the steel in a rust-resistant skin. Next, a highly durable carbide black powder coat is applied. This finish further enhances resistance to rust and completes the boards with a sleek, seamless look. AscentSteps™ are equipped for all seasons of the year, easily withstanding exposure to the elements and avoiding rust, chipping and UV damage. 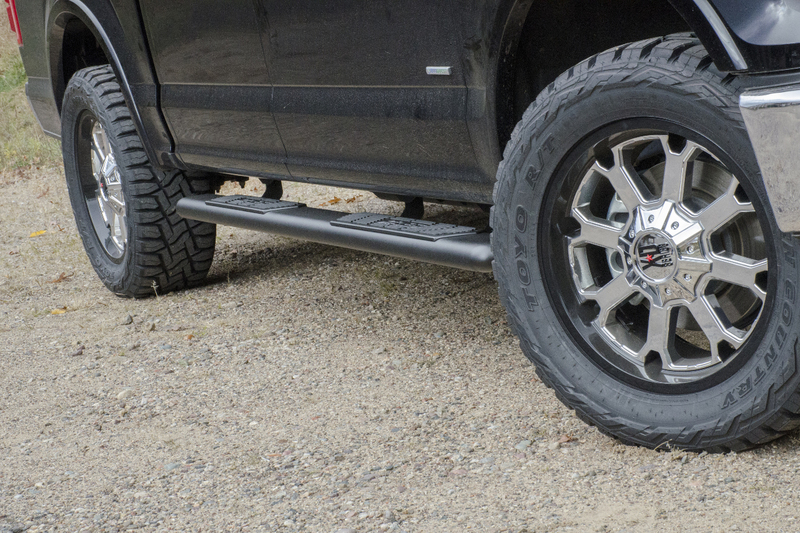 For professional-level installation, AscentStep™ running boards mount using the ARIES VersaTrac® system. 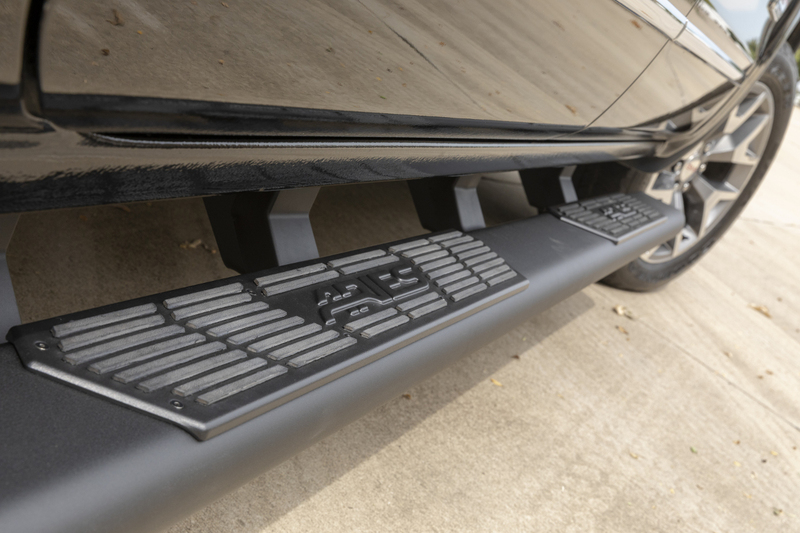 This innovative installation system uses vehicle-specific brackets to accommodate various running board options -- any running boards or truck steps that are VersaTrac® equipped. 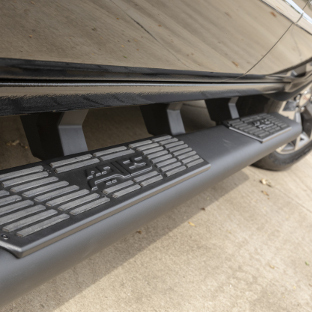 All sets of AscentStep™ running boards are designed for vehicle-specific application for factory-like integration. They mount with no drilling and no difficult vehicle modifications required. 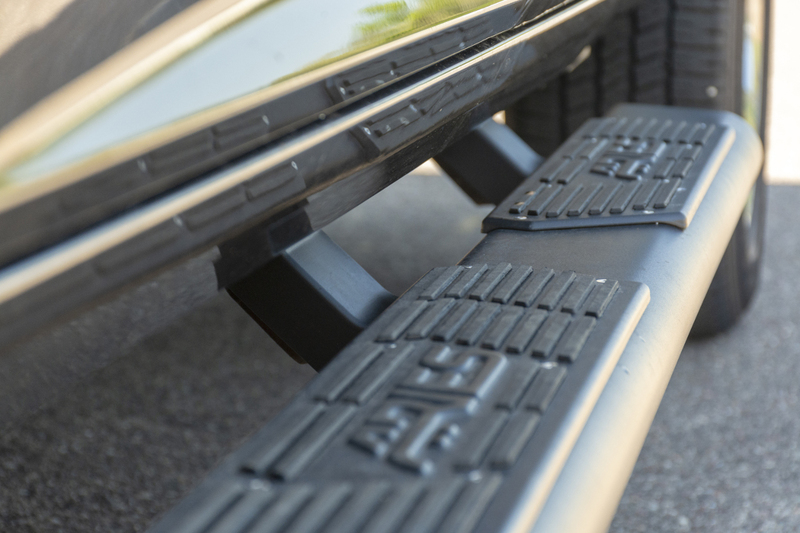 To complete the installation of your AscentStep™ running boards, we offer VersaTrac® bracket covers. 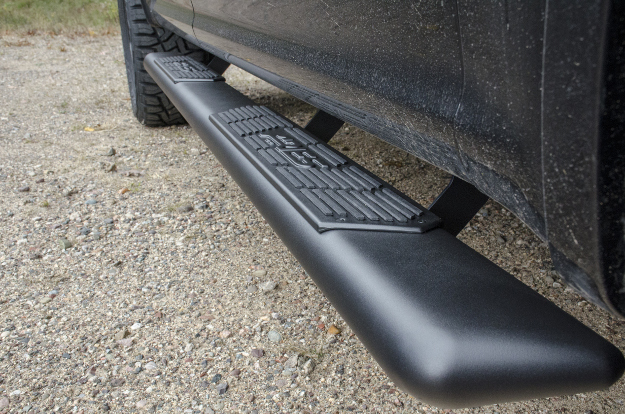 These simple covers easily bolt into place during the running board installation for a more integrated look on the truck. The covers also help protect the VersaTrac® brackets, featuring a tough black thermoplastic rubber construction. Installing over the top of the brackets, they add protection against rain, snow and debris for long-lasting rust prevention.